Atheists and evolutionists bucked and kicked at the news that soft tissues were found in fossils. Some even accused creationists of lying or at least misunderstanding the reports. It was not our problem that they were the ones who were uninformed or in denial. Worse for them, the more soft tissues and other fascinating instances of preservation were found. Once again, there was mandatory overtime at the Darwin Ranch where help was needed at the excuse mill to save deep time dogma. Rescuing devices were utilized to no avail; the facts were not made to ride off into the sunset. (Who does that, anyway? You can't see where you're going none too well.) Sometimes the preservation is on a large scale, and other times very delicate features have been preserved. Sorry Hoss, they cannot last millions of years, nor can things be buried slowly. Excellent preservation (indeed, as are fossils themselves) are testimony to the Genesis Flood and the young earth. When the first dinosaur blood vessels, proteins and skin cells were discovered, many creationists thought the fix was in for the moyboys. . . .
Evolutionists used to state adamantly that proteins, cells and DNA could not last for a million years, let alone ten thousand. Any biological material would become permineralized and turn to stone in short order. But when soft tissues started turning up fossils from the age of dinosaurs and earlier, they began saying, like the dead man, “Well, I’ll be. 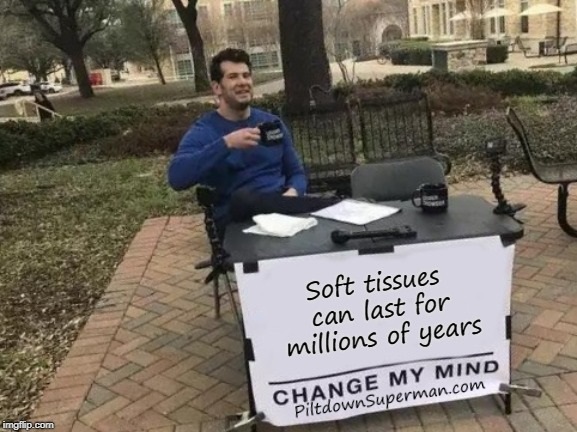 Soft tissue can last for tens and hundreds of millions of years.” Watch them do it right here. To see the show — well, to read the entire article — click on "Amazing Preservation Fails to Shock Evolutionists". You may also like this short article: "Delicate Spider Fossil Discovered".